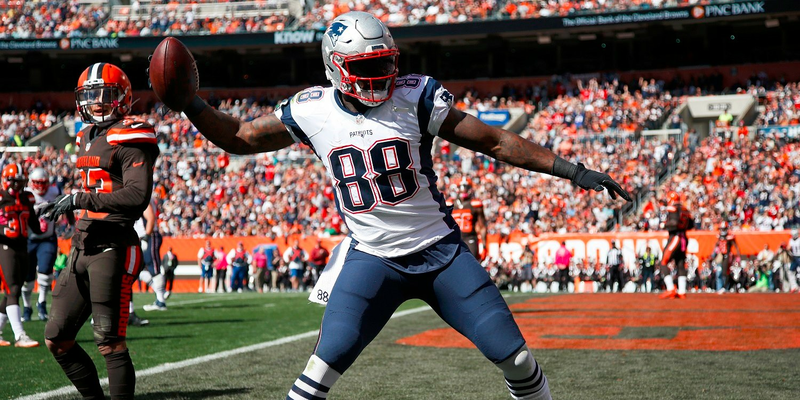 Martellus Bennett is a huge character in the New England Patriots locker room and has become a key part of the offense. One week it could be multiple touchdown games or a one catch week but he likes it that way. "Whatever they're giving us or whatever they're trying to take away, we just go with the flow and Tom (Brady) is going to hit whoever is open," said Bennett, who caught just one pass and played only 30 snaps versus Pittsburgh. "You never know what's going to happen. Our gameplan is like a box of chocolates. You never know what you're going to get." Bennett added: "I think, for me, a big game isn't just stats. It's blocking. I could have a really, really big impact on a game by my blocking. I don't really look at my impact as far as catching the ball or anything like that. I just look at it as doing my job, that I execute well and open up gaps and do what I have to do to the best of my ability." The Patriots have arguably the best offense in the NFL but Rob Gronkowski, Julian Edelman and LeGarrette Blount are the only weapons that will get consistent work each week. The rest of the weight will be shared between Bennett, James White and Chris Hogan which is just the way Bill Belichick has worked over the years. For Bennett, he will probably get the least work out of these three because of the Pats operating a 3 WR AND 1 TE set with Gronk the first choice tight end. Since Brady's return the Pats have decided to keep a balanced offense having attempted 102 passes and run the ball 87 times. This shows that all pieces of the offensive puzzle will be used by Belichick in certain situations, which is good for a player like Bennett.